Hmmm…what to do with extra pumpkin leftover from last week’s treat? Tossing it would be a crime! We have just enough to try our hands at Brown Butter Pumpkin Toffee Oatmeal Scotchies. And as avid bakers (we think baking every Saturday qualifies us for this!) we’ve never made brown butter. This yummy recipe is not only a great way to be resourceful, but also a way to learn a new technique. It’s a win all around! Place butter pieces in a medium skillet. Melt the butter over medium heat, swirling it in the pan occasionally. The butter will foam and pop, so be careful. Continue to swirl the pan often. Remove pan from heat once the butter starts to brown and smells nutty. There will be small brown bits on the bottom. The butter should be an amber color. Pour butter into a small bowl and cool to room temperature. You can put it in the fridge to speed up the process, that is what I do. While the brown butter is cooling, whisk together the flour, baking soda, pumpkin pie spice, salt, and cinnamon in a medium bowl. Set aside. Add the egg whites and vanilla extract and mix until combined. Beat in the pumpkin and mix until combined. Turn the mixer to low speed and slowly mix in the dry ingredients. Mix until just combined. Stir in the oats and butterscotch chips and Heath. Chill dough in the fridge for 20-30 minutes. When dough is chilled, form cookie dough into 2 tablespoon sized cookie dough balls. Place on prepared baking sheets, about 2 inches apart. Bake cookies for 12 minutes or until slightly brown around the edges. Remove from oven and allow the cookies to cool on the baking sheet for 2-3 minutes. Transfer to a wire cooling rack and cool completely. Top with cream cheese frosting. YUM! Whistles are blowing, marching bands are marching, and crowds are cheering. Are you ready for some football! You most likely won’t find us watching the game play for play, but grazing the tailgate spread instead, especially if Brownie Bugles Bites are on hand. Think puppy chow meets white trash smothered in gooey goodness. It’s definitely a game changer! Put Bugles into a large plastic bag. Set aside. Melt Rolos in a heat safe bowl over a pot of hot simmering water. When they are almost all the way melted, stir in butter until combined. Pour the melted chocolate/caramel mixture into the bag of Bugles. Gently move it around with both of your hands. 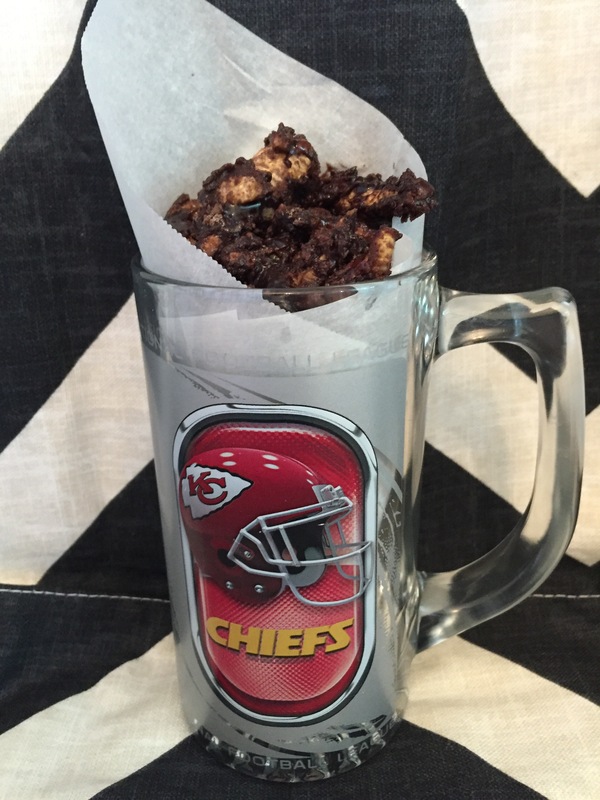 With only half of the Bugles covered, open the plastic bag, and sprinkle in 1 1/2 cups dry brownie mix and Heath. Continue moving it around in the bag gently. Make the other half of the brownies mix with 1.5 eggs, 1/3 cup oil, 2.5 tbs of water. Melt 1 cup dark chocolate chips. Pour the bugle mixture into a bowl and cover with the made brownie mix. Place on a parchment lined large baking sheet and pour melted chocolate on top and gently stir. Allow to cool.